Looking for the rental of a storage unit in Lakeside (or elsewhere in East County)? Consider having a Big Box delivered right to your Lakeside home or business address in zip code 92040. In doing so, you’ll enjoy having to avoid the hassle and cost involved with renting, loading and unloading a truck. Just load the Big Box right at your Lakeside address and it will then be picked up by a company driver once you’ve concluded the loading. It will then be stored inside the company’s secure storage center in the Lakeside area. Accessing your belongings while in storage is always an option. The company is open seven days a week for your convenience. The company also offers services across the county including Tierrasanta as well as Imperial Beach. 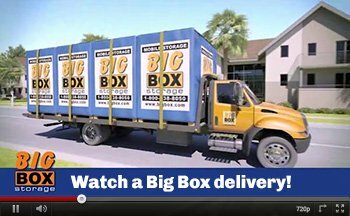 You will not find more affordable storage rental rates in Lakeside than those offered by Big Box Storage. 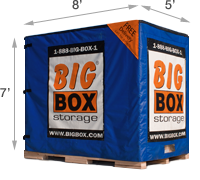 Monthly rental prices begin at only $64 for a Big Box and are also backed by a low price guarantee. If you come across a superior rate with another Lakeside storage company (or any storage company in San Diego County), please inform a Big Box Storage account representative by calling 619-436-5020. You’ll then be given a rate equal to 10% less than that found elsewhere. That said, Big Box Storage is confident that the everyday standard rates are already the lowest in Lakeside. Each Big Box rental container holds up to about 1.5 rooms of belongings. If additional space is needed, you can certainly have additional Big Boxes delivered to your Lakeside address. Note though that you’ll only be charged for the number of Big Boxes that you actually end up using – not necessarily the amount delivered. For example, if you have two delivered and then find that you can fit your items in only one, you’ll only have to pay for the one. To schedule a Big Box delivery, please feel free to utilize the online scheduling form. The process takes approximately two minutes and will also provide you with a $25 instant credit towards your first month of storage rent. If you have any questions or comments, representatives are readily available by calling 619-436-5020.